Continuing with my unplanned theme of sails this week (both yesterday’s post, and the one from the day before, had to do with sails, or sailing), I think I’d like to talk about the Ketch rig. Since we purchased our Amel a year ago July, we have been asked our opinion of the Ketch rig by many people, both how we like it, and how we use it. Until now, my answer has always been that we don’t really know much about it, that we are just figuring it out. Now, 16 months later, I feel that I can at least start to render an opinion. To get the novices reading this up to speed, a Ketch is a two-masted vessel where the rearmost mast is shorter than the forward one, and is positioned in front of the rudder. If the rearmost mast is as tall, or taller than the foremast, the vessel is Schooner rigged. If the shorter rear mast is aft of the rudder, the boat is considered a Yawl. That said, almost all Amels are ketch rigged, so obviously the designer, Henri Amel, thought that there was some benefit to this particular rigging setup. What advantages was he considering? Was it speed? No, I don’t think so. As I understand it, the basic idea behind a Ketch rig is that the sail plan of the boat can be spread out over two, smaller, more-manageable sections, as opposed to a Sloop, a single-masted boat with one large mainsail. His belief was that this configuration would be easier for a short-handed crew, a cruising couple, to deal with. Now with some experience behind us, we tend to agree. Frost under sail towards Carriacou. Photo courtesy of our friend Dirk on Evening Ebb. Note that Evening Ebb is also a Ketch! Surprisingly to us, many owners of Ketch rigged boats tell us that they hardly ever use their mizzen, the rear sail. In fact, a new friend of ours has even removed it from his boat to save weight! I know that on the newer Amels the mizzen does not have electric furling as the mainsail and the genoa do, making it a bit more of a hassle to deal with, relatively speaking, but still, it can be handled quite easily from the safety of the center cockpit, so why not use it? Well, one reason that people don’t use it is that they say it doesn’t affect the performance of the boat very much. This, I have tried to come to grips with. We almost always have our mizzen raised, and in fact, it’s the first sail we typically put up, and do so before we even raise anchor. Our boat also sails quite well, even to weather (towards the wind), with just the mizzen and genoa (some people refer to this sail configuration as jib and jigger). We have been told that when sailing close hauled, that is, as close to the wind as a boat can point, the mizzen is actually a hindrance, assuming that the main is up too. The thought is that the mizzen gets backwinded, and actually slows the boat down. Always willing to experiment, during our last passage from St. Lucia to Martinique, as we were sailing close hauled, I actually dropped the mizzen, wanting to see if lowering it would have any effect. It didn’t, which does not support the theory that it was slowing us down, but nor does it show that it was helping us in any way! Some people leave the mizzen raised at anchor, to act as a riding sail of sorts. This supposedly helps to keep the boat pointing in to the wind, and stop it from sailing around at anchor. We’ve never had a problem with this, and so have never done it. We have, however, come across several Ketch rigged boats that did have their mizzen raised at anchor. 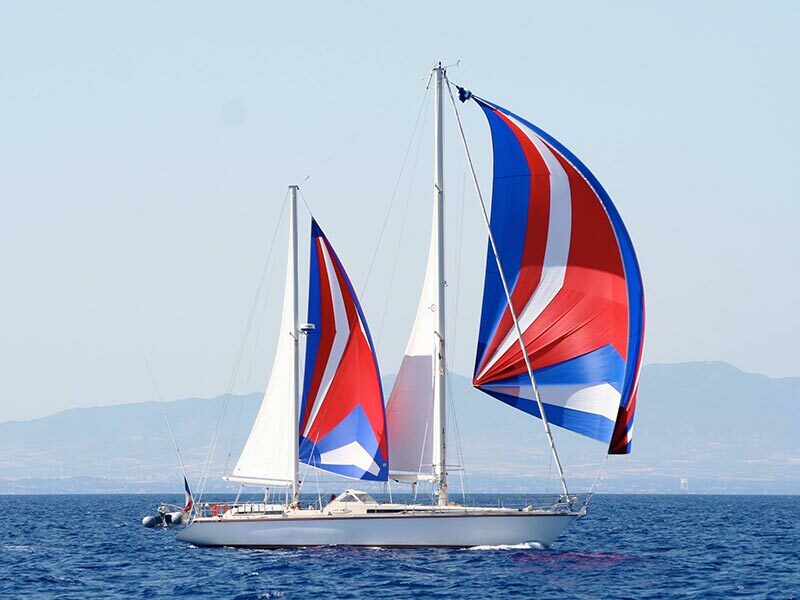 The rear mast of a Ketch also allows the boat to fly a mizzen staysail, a light air sail that flies forward of the mizzen mast, for use when sailing downwind (see image below). We don’t have such a sail, but I’ve seen photos of them. They look nice, and I’ve heard that they’re quite effective. I’m not sure who this Amel belongs to, but it is beautiful! If this is your boat, please let me know and I’ll edit the post to give you credit. Recently we had someone comment on a photo of our boat on Facebook, saying that the Ketch was a poor rig choice, that a cutter would be better. Not interested in engaging in another pointless internet argument with some anonymous guy, I simply replied that we are all entitled to our opinion. Obviously Henri Amel, the designer of our boat, felt differently than this fellow. And given the number of Amels here in Martinique, and also Ketch rigged boats from other designers (we are surrounded! ), I’d say that there are a great number of people who feel differently! Another great adventure, and I don’t mean the flights. I’ve always had an affinity for ketch rigs. A nice ketch just look beautiful, just look at LF Herreshoff for example, pure class…. I don’t have a boat of my own yet, but it will likely be a ketch when the moment comes (a 37ft Jeanneau Gin-Fizz is my sweet spot). The literature I’ve come across supports your observations and that of many others, and Amel certainly is one of the major references when it comes to this type of rig. Just yesterday I also found on Youtube a video by Capt’n Fatty Goodlander describing the benefits of the ketch. Another small benefit of having a mizzen is that it’s perfect to mount some electronics and wind genny up and out of the way! But in the end, as you said it’s a matter of preference and what kind of sailing you’re after. From my limited non-sailor view, it looks like in the past thirty-ish years, the mass market has become “biased” in favor of performance which may have shaped the preferences of a majority of owners, and ketches seem to be predominantly about cruising comfortably, with speed not really being much of a priority. With most manufacturers delivering sloops and cutters, it could even be argued that a lot of biases might come not from the rigs themselves but from the sailors’s familiarity with them, and their expertise in handling them to their full potential! And there’s even the odd ketch-rigged catamaran too! 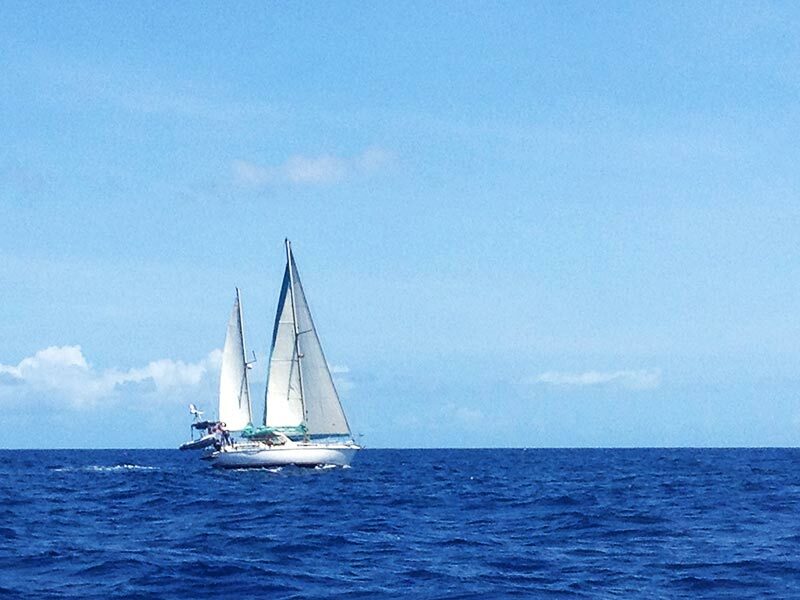 Our boat is a cutter ketch, and that provides us with a nice heavy weather configuration: mizzen and staysail. I agree that hard on the wind the mizzen doesn’t add much – maybe a half a knot. But it is a great help on a reach! And yes, that second mast is a very convenient mounting place for radar, etc. A cutter ketch, the best of both worlds perhaps. Yeah, I can see how that would be made more challenging by the additional stay. How do you do it? Just pull it through? It can be a pain. But if the staysail is set it helps, because the yankee can’t form a billow around the inner forestry. Mike, I agree with everything you wrote. Re: downwind, we have a lot of downwind time on Liberty (among others, st Martin to Texas – 2000 mm – in 2014). If the wind is strong, it can sh the stern around. Your autopilot will tell you. We have a reef in our mizzen, and we use it above 25 kts or so. Hence my comment on reefing off the wind under sail. I see so many sailing with just mizzen and genoa when the wind is above 15 mph. . I always figure it must be well balanced that way and sort of a lazy man’s reefed main equivalent. That sail combination does work very well. I owned a Ketch Rigged Duncanson 40 for about 12 years, after sailing many race boats before and extensive coastal cruising, learning to get the best from the Ketch rig took some time, but when mastered was well worth it, and if I buy another sailboat it will be a Ketch. The mizzen sail was always the first to go up and never taken down when either racing or cruising the boat. Going to windward required maximum traveller down until some backwinding occurred from the genoa and then sheet the mizzen up until the boom is along the centreline of the boat. I had a mizzen staysail which was quite flat and tacked at the base of the main mast, this could also be flown similar to a blooper beside a poled out headsail for comfortable down hill cruising and surprisingly fast. The jib and jigger rig is amazingly efficient in heavier air and I never bothered reefing the main, just get rid of it. I wasn’t familiar with the Duncanson 40 so I just looked it up. Nice looking boat. Thanks for this – very informative and also comforting to hear your positive views. We are newbies going to live aboard in the spring and have just bought a 33 ft ketch. My husband liked a ketch for many of the reasons you mentioned, eg short handed sailing (It’s just us and I am creaky!) and I like them for no better reason than I think they are beautiful. However beauty is not all and I am pleased to hear how much you use the mizzen. As you say, they were designed for a reason and we should discover their uses and benefits not chuck them away! The Ketch rig is not only a cruising rig as you may recall New Zealand’s Steinlager II. Thanks for sharing your take on the rig Mike. From your point of view, do you think the benefits outweigh the added complexity and quantity of rigging, equipment and sails? We’re planning to get a Zeus target, (aka Catamaran) but may wind up with a mono if the cruising kitty doesn’t swell enough in the next few years. I really don’t see it as added complexity, and compared with a sloop of similar length, the rigging, and sails on a ketch will be smaller, offsetting much, if not all, of the cost difference. We have a ketch rigged Transworld 41. I have sailed sloops mostly since learning to sail 10 years ago. However, we opted for ketch rigged vessel when we chose our cruising boat. We did it for several reasons, not the least of which was the ability to put up smaller sails on shorter masts and be able to handle them alone if necessary. My wife and I are both fast approaching 60 and I had a heart attack and subsequent open heart surgery last year, after we’d purchased the boat. She had ovarian cancer a couple of years before. We intended to go cruising and see the world as well as our meager budget would allow in the time we have left on Earth, and the ketch is the BEST of many worlds. If a boat were an RV, a ketch would be the best engine. While I am actually still “learning” new things all the time about this rigging and we only have four sails to deal with, I’ve found that I can move this boat with JUST the mizzen up. So – for your edification (the author above) who has to deal with “random opinions from the internet” (as I do) your choice of rigs was, essentially, the best of all. The boat is beautiful (ANY ketch is pretty). The ketch is a working rig. The ketch is versatile. The mizzen can be used to get you out of trouble. The rig has other advantages you’ve already mentioned. Anyone that says it’s “obsolete” isn’t actually a cruiser I would say. There are salty sailors out there who’ve sailed and traveled in everything. There are cruisers (some salty, and some usually covered more in mud from getting unstuck, rather like myself), and there are arm chair sailors/cruisers who sit at home on the Internet and talk…. and rarely, if ever, do. Take heart in the fact that your chosen method of motivation and navigation is perhaps one of the most awesome, most looked at, and most beautiful ships on the sea. Nice comment, Rick. Thanks for posting. I missed this when you posted originally, so finally caught it via Facebook. As you might recall, Beausoleil is also a ketch, and is rigged slightly different from the Amel. It’s not “quite” cutter-rigged – the staysail is tacked at the bow, and the headsail at the end of the bowsprit. The staysail was originally self-tacking on a boom, but with a furler installed we went to a clewboard instead. With furlers on the headsail and staysail, 3 reef points on the main and 2 on the mizzen, and an asymmetrical spinnaker, we have an almost limitless combination to work with – and that’s without a mizzen staysail. We use the mizzen most of the time, even upwind. With the mast of Formosa 51’s like ours pretty far forward, the mizzen is needed to help balance things, otherwise we’re fighting wicked weather helm. And since we purchased new sails from Mack Sails back in 2011, we can point much higher than before. The addition of the new staysail helps tremendously – before we could only point up to about 55 degrees apparent, but now we can sail up to 45 apparent, and pinch as high as 40 if the waves are too bad. My only complaint is that as a rear-cockpit boat rather than center cockpit, the mizzen boom is a bit low. I’m only 5′-7″, but our bimini is just barely over my head. Taller guests have to duck. I’ll consult with a sailmaker about possibly raising the mizzen boom about 6″, which can be done without re-cutting the mizzen. Hi Jon. I’m trying to remember but I think we were just on a boat that had raised their boom to give more room in the cockpit. That or I just read about someone doing it. I can’t think of who it is at the moment though. Our friend Dirk’s ketch is also an aft cockpit, and we’ve been on board it a number of times. If I recall his boom is high enough to stand. At least for shorter guys like you and me. I just love the looks of a Ketch! One thing I will say is that modern Sailing is trying to get people to go faster. In this caffeinated world we don’t need that. Most people get into sailing to get away from the caffeinated world and then buy into a caffeinated kind of racing sailing. I’m of the opinion that sailing is all about being present and enjoying the moment. And to me that means having the ability to take your time and set your sail plan accordingly. It seems that a ketch is more forgiving and allows one to hoist the main while jib and jiggering which means that you can amble along and take it all in. Benefit, I think so !!! I agree. We came to enjoy the flexibility that the ketch rig afforded us.